Although simple, silicone wristbands have become increasingly popular over the past few years. Today, it is one of the most fashionable and popular products around. Not only is it stylish and attractive, it is a great way to promote and advertise one’s business. Although simple, silicone wristbands have become increasingly popular over the past few years. Today, it is one of the most fashionable and popular products around. Not only is it stylish and attractive, it is a great way to promote and advertise one’s business. In addition, many individuals and organizations use these bands to make a religious or a political statement, as well as to raise funds. Silicone is a synthetic compound used for a variety of purposes. This semi-organic polymer is rubber-like, flexible and is resistant to heat and water. It is used in making watertight seals as well as in electrical applications. It does not stick and has low chemical reactivity. Because of its fine qualities, this polymer is used in producing products like wristbands. Silicone wristbands were made popular by cyclist Lance Armstrong. The Lance Armstrong Foundation used these wristbands as a fund raising tool in 2004, and since then, the popularity of this product has never waned. Many other charities and institutions have jumped onto the bandwagon, and have used these wristbands to raise funds. Politicians, actors and athletes have all worn silicone bracelets, cementing its place as fashionable item. These wristbands are comfortable to wear and are easy to clean, attributes that make them very popular. They last for a very long time as well. 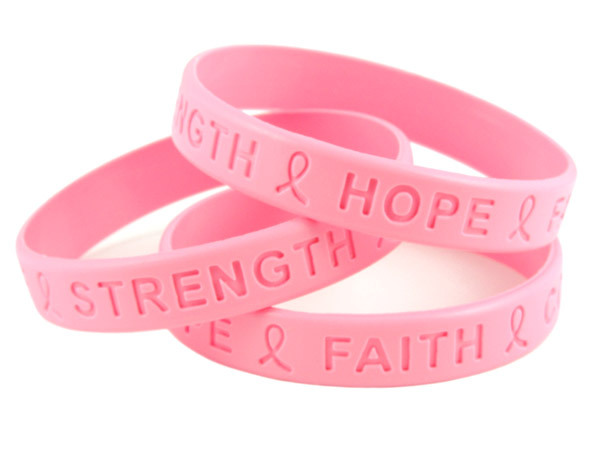 Silicone wristbands come in many forms, colors and sizes. There are casual wristbands and formal wristbands, and then there are those that awe the people around you. These wristbands are an effective tool to advertise one’s business or company. They also make great gifts for your near and dear ones. There are even wristbands that have text imprinted on them. Although popular and fashionable, these wristbands are simple and cheap to produce. They are available at almost every store for a few dollars. However, it is cheaper if you order these wristbands online. Customers even have the option of creating their own customized wristbands, with their choice of color and phrase. Silicone wristbands fit all people, irrespective of age. This makes them an excellent choice for your next fundraiser. Make a powerful statement with the boldest and finest wristbands available in the market.